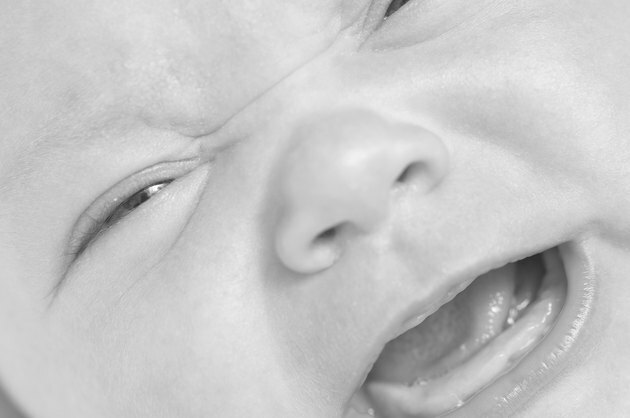 Causes of cough in a six month-old baby include cold, croup, viruses, allergies and sinusitis. While most of these illnesses are mild, hearing your baby cough is worrisome, particularly if your baby is fussy. Most physicians won't treat your baby's cough with medication, but there are some ways to soothe a cough until your baby starts to feel better. Most coughs are harmless, but if your baby's cough doesn't get better within one week, it's best to contact your physician. Other reasons to call your physician include if your six month old is struggling to breathe, wheezing, coughing up blood or has a fever above 103 degrees Fahrenheit. Over-the-counter medications for coughing are often called cough suppressants, expectorants or decongestants. The American Academy of Pediatrics does not suggest using these medications with children who are under the age of two. These products are not proven as safe for children this young and are not proven effective in treating coughs. The only time you should administer one of these medications is if your physician advises you to give it to your baby. Warm, steamy air may help soothe a cough. If you don't have a warm mist humidifier, sit with your baby in a bathroom with the hot water running in the shower for about 20 minutes. Exposing your baby to cold air is also potentially helpful. Use a cool-mist humidifier in your baby's room while he sleeps or take him out into the cold outdoor air for about 15 minutes; dressing him appropriately for the weather conditions. Cold drinks such as juice may soothe baby's throat, but do not give him orange juice, which can irritate a sore throat. Always consult with your physician when your baby has a cough if he has a chronic illness such as a lung or heart disease. If your baby stops breathing when he coughs, call 911.